Route: Gandhi Statue > Minsk Square > Cubbon Road > Ulsoor Road > Trinity Circle > Anil Kumble Circle > Gandhi Statue. 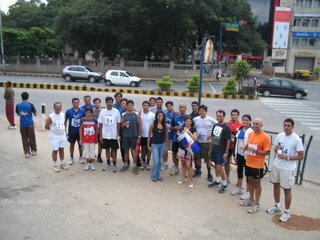 In what could be my last outing for sometime, I joined Runners For Life (RFL) on their Sunday morning run. 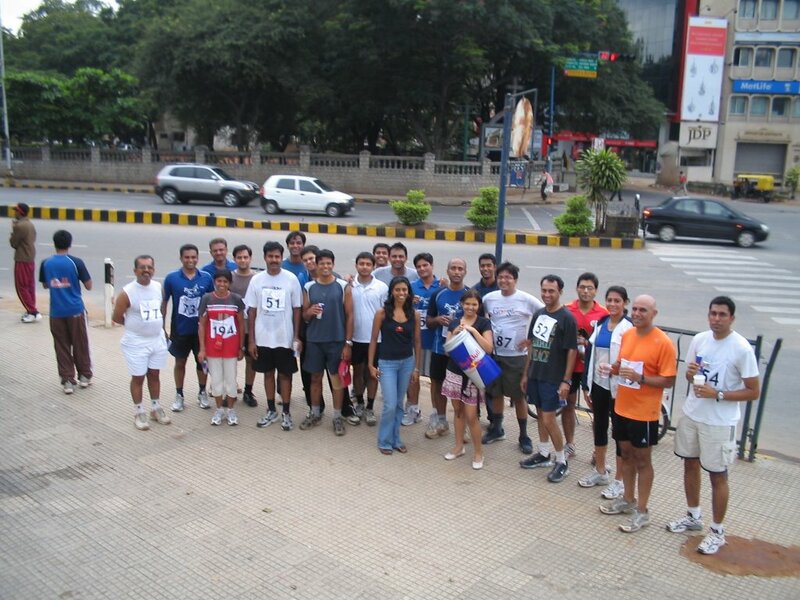 Runners for Life (RFL) is a group of people who are passionate about running. On all of my three previous marathons, I had met and made friends with a few of RFL’s runners. 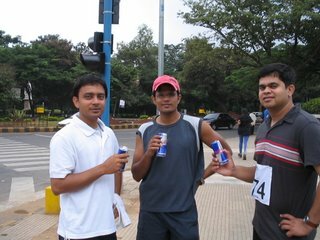 During the last Bangalore marathon, I met Aravind Bharati and the RFL pamphlets distributed at the stadium helped get on their mailing list. I have been trying to get Buckeet into the running, cycling thingi. We had cycled to lalbagh one other Sunday and walked around the lake in lalbagh. So he was more than eager to join me on the run. But, what is life without challenges, so we said, lets get Tima to run too. Takes me back to Having a Healthy disregard for the impossible quote. I don’t know how he managed, but when I reached Gandhi statue on Sunday morning, guess who was smoking a ciggie there. By 6:30, there were about 40 RFLers to run as many laps as they could of the 5.6km track. 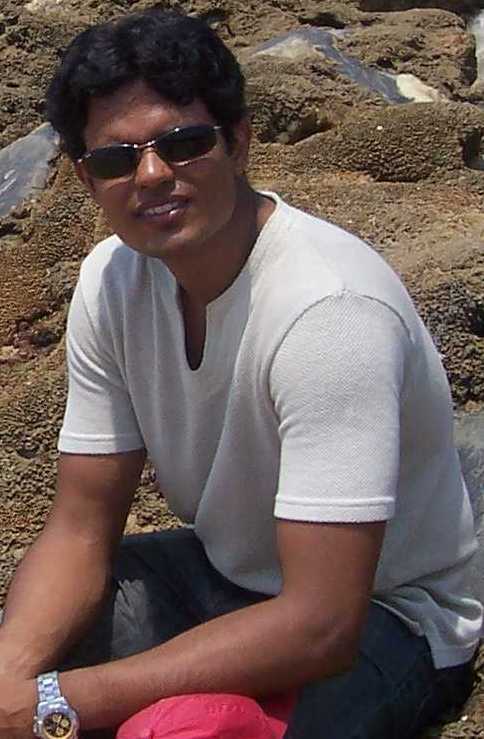 Dr. Rajat Chauhan runs with RFL too. He advised me against running and I decided to accompany Tima to walk the distance. We took nearly one hour to finish. For once, it did look like the early birds catch the worms, only, in this case the birds were running, and the worms – sizzling hot. Thanks to some focused promo, Red Bull had a two hot uns, get us to try their energy drink. Am not sure if it was the gals or the drink, I sure could have torn some trees after that! As Gyanender, bucket, I and Tima (donkey at the end) had breakfast at Coffee house, we knew one thing – This is surely not going to be last we are going to run with RFL. But for me, I will have to take this brief hiatus from biking, cycling, running, et al. A split second (one I can never forget) decision to block a rare powerful kick from an opponent during football four years ago, has left my left (3 left’s in 5 words!!) knee Anterior cruciate ligament (ACL) ruptured. Yes, I silently suffered the pain on my endurance runs/rides all the time. Good sense prevailed; I am getting reconstruction done next week, with rehabilitation taking 3-6 months. Guess what, I am on spinal anesthesia, meaning, I can be awake and aware as I get operated. So, are you reading my next blog already?? ACL ruptured? !..have no idea what it is but good to know u're getting it repaired..looks like I'm talking abt some machine part eh?.. :)..anyways,hope u recover soon..and hope Tima has recovered from this run!..